Finding storage space in a small apartment is a challenge. Try these tips. Finding storage space in a small apartment is a challenge. Try these tips. Urban living is convenient. You can be close to work, nightlife, shopping, dining, and more. But living in or moving into a small apartment is not always convenient. To make a small apartment seem bigger, you have to get creative. And to make moving into a city apartment easier, use one of the best moving companies in Greensboro, NC: Steele & Vaughn. Then once you get moved in, try these 8 tips for storage in small apartments. Vertical storage. Shelving can go as high as your ceiling allows. Just be sure to keep a step stool handy. For safety, be sure to install shelves properly and don’t overload them. Hidden storage. Find furniture with hidden storage like ottomans with storage space inside, benches with storage space underneath, and trunks or chests for coffee tables. Collapsible items. Necessity is the mother of invention. 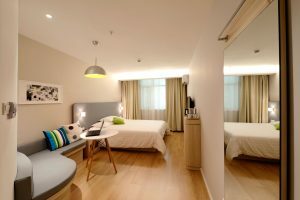 Small apartment living has inspired the invention of many collapsible items like Murphy beds and fold-away tables and chairs. Added storage. Lacking closet space? Get an armoire or cabinet for hanging clothes. Not enough storage space in the kitchen? Add a pantry cabinet, even if it’s in the next room. Mobile kitchen islands can add both storage and seating to your kitchen. Hang items. Get some strong hooks or pegboard and hang everything you can on the walls, from bicycles to pots and pans. Even your foldable chairs can be hung on the walls when not in use. Done neatly and strategically, it can actually look artsy. Organizers. Your stuff can fit in smaller spaces when properly organized. Organizational strategies can help you eliminate the things you don’t need and condense the stuff you do need into a smaller space. Under bed storage bins, vacuum-seal bags, closet organizers and more can help solve your storage problems. Door strategies. Hang spice racks on the inside of cabinet and pantry doors and save a lot of cabinet space. Use hanging shoe organizers for other items besides just shoes, such as storing bathroom items when you’re lacking cabinet space or toys in kids’ rooms. Consider removing doors from closets and using the space in other ways; even hanging curtains in doorways will eliminate the need to leave space for swinging doors. Do you need help moving into your apartment? Whether it’s on a high floor or lacks parking, moving into city apartments can be difficult. When looking for moving companies in Greensboro, NC be sure to find one that can handle apartment moves. Steele and Vaughn has plenty of experience with urban moves in cities of all sizes. Simply explain your individual moving requirements and Steele and Vaughn will give you a quote based on the things to be moved and the length of time and manpower that will be required. Get your things easily, quickly, and safely from point A to point B. Call Steele and Vaughn: (336) 273-0546.